Days of Our Lives (DOOL) spoilers for Friday, April 20, tease that Kate (Lauren Koslow) will battle some confusion at the DiMera mansion. She cornered the mystery woman upstairs and was stunned to see Abigail (Marci Miller) in a dark wig. Kate will struggle to understand what’s going on. She’ll push for some answers, but “Gabby” may not offer very many. 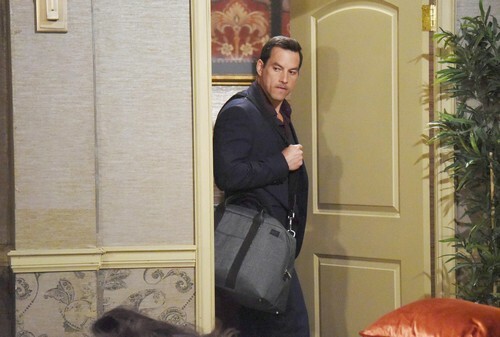 “Gabby” will knock Kate out and urge Stefan (Tyler Christopher) to put her in the tunnel. It’s starting to get a little crowded down there! DOOL fans know Stefan just picked Vivian (Louise Sorel) up kicking and screaming. He placed her in captivity with Marlena (Deidre Hall), so Kate will join the two of them. Days spoilers say Vivian will share the surprising news with the other captives. She’ll probably reveal that Stefan plans to flee Salem with Abigail’s alter. Kate, Marlena, and Vivian will put their heads together in Friday’s episode. They’ll try to figure out a way out of this mess, but they may be stumped for now. Fortunately, John (Drake Hogestyn) will remain determined to find Marlena and bring her home. Days of Our Lives spoilers state that Paul (Christopher Sean) will pitch in as well. They’ll go over the clues and realize Abigail must be connected to Marlena’s disappearance. John just won’t be able to shake the idea that something’s up with Abby, so he’ll decide to dig deeper. Other Days of Our Lives spoilers say Rafe (Galen Gering) and Hope (Kristian Alfonso) will get closer to the truth. They haven’t identified the mystery woman yet, but they have a new angle they’re working on. During their chess match, Stefan confessed to setting Chad (Billy Flynn) up with drugs in Hong Kong. He wasn’t wearing a wire, but the bribed security guard doesn’t know that. Hope and Rafe believe they might be able to get this guy talking. Shawn (Brandon Beemer) could probably help out with that mission off-screen. Whatever the case, this mystery will slowly unravel. The puzzle pieces will likely point to Abigail sooner or later. Back at the DiMera mansion, Stefan and “Gabby” will hit the sheets. Chad (Billy Flynn) will walk in on Stefan in bed with his wife, so expect major drama! We’ll give you updates as other Days details emerge. Stay tuned to DOOL and don’t forget to check CDL often for the latest Days of Our Lives spoilers, updates and news.